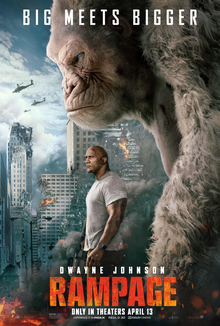 Rampage is a 2018 American science fiction monster film directed by Brad Peyton, loosely based on the video game series of the same name by Midway Games. The film stars Dwayne Johnson, Naomie Harris, Malin Åkerman, Jake Lacy, Joe Manganiello, and Jeffrey Dean Morgan. It follows a primatologist named Davis Okoye who must team up with George, an albino gorilla who turns into a raging creature of enormous size following a rogue experiment, in order to stop an invasion of monsters. Chris Stuckmann reviews Rampage, starring Dwayne Johnson, Naomie Harris, Malin Akerman, Jake Lacy, Joe Manganiello, Jeffrey Dean Morgan, P.J. Byrne, Marley Shelton, Breanne Hill, Jack Quaid. Directed by Brad Peyton.